Those are my feelings exactly. I am well over 100 pages into the book (701, to be exact), but that’s still how I feel. It may have taken me a few months to get there (I’m a slow reader already, and 750 dense pages don’t help speed things up), but I’m almost finished, and while I want the satisfaction of saying I read the whole thing, I really don’t want it to end. Like the Strand employee, I still want to spend all of my free time reading it. I still want my arms to hurt from holding it on the subway (slow reader, out of shape…the fun never stops here). I know finishing a 750-page book is no accomplishment in the grand scheme of reading, but even more than being able to check this work off my list (by the end of this week, I hope), I feel as though I’ve come to know Lincoln, and some of the “rivals,” like William Henry Seward and Edwin Stanton, very closely. I’ve come to understand a time period in a much deeper and more complete way than I ever would have through a high school or college textbook. Fifty pages from now, the book will be over and Lincoln, who seems to be in his prime right now as he starts his second term, gets the Thirteenth Amendment passed and starts working on a plan to negotiate peace with the Confederacy, will be gone. I only wish I was that Strand staffer who is just starting out. P.S. 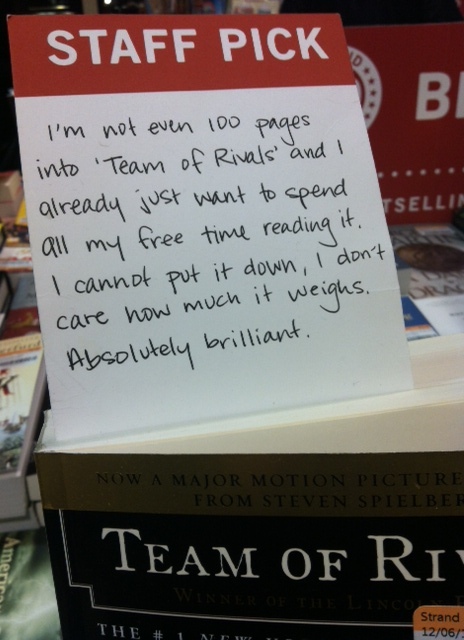 – If you’re in New York, the Strand has several sparkling new copies of Team of Rivals just begging you to buy and read them. Do it!